Don’t worry! We’ve condensed all 3 movies into 1 quick post. Read on and impress your mates with your Decepticon (they’re the baddies) knowledge. By the way, this post is obviously full of SPOILERS. Some poor kid (Shia LeBeouf) discovers that the new car he bought to impress Megan Fox is actually a big robot from the planet Cybertron. He meets a load of other robots, the Autobots, who tell him about their war with the Decepticons, who want to steal some kind of power source (which is called the AllSpark) that’ll turn every piece of technology ever into a transformer so they can take over the universe. 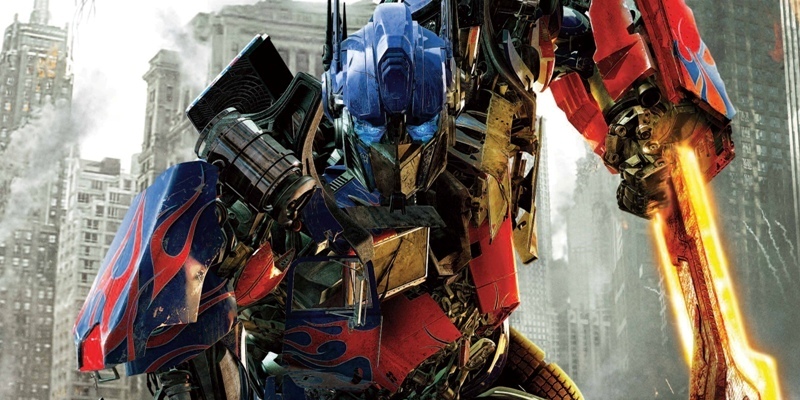 By the way, the leader of the Autobots is Optimus Prime. He’s really important. There’s a big fight between the robots. Bang, boom, bang bang, and then the Autobots win. But it’s actually Sam who kills the leader of the bad robots (he’s called Megatron) by releasing the power of the AllSpark into Megatron’s chest. Everyone lives happily ever after – especially Sam, as Megan Fox agrees to be his girlfriend. D’aww! Its two years later, and Sam is still going out with Megan Fox. Unfortunately, there’s no time for smooching as the Decepticons have come back. This time they’re planning to blow up the Sun using something called the Matrix of Leadership. To get this, they have to access some symbols…which happen to be in Sam’s head. Uh-oh! Anyway, there’s lots of fighting then oh no! Optimus Prime (the important one, remember) gets KILLED by Megatron! The rest of the Autobots and Sam are really sad, so they go and see an old Transformer called Jetfire. He eventually sacrifices his parts to bring back Optimus, allowing Optimus kicks seven bells out of the baddies. Everyone lives happily ever after – especially Sam, as Megan Fox is STILL his girlfriend. Nice one! Bad news: Sam is no longer going out with Megan Fox. Nope, instead, the world’s luckiest man is now with Rosie Huntington-Whitely! A lesson for you there kids: hang around with big robots if you want to meet the world’s most beautiful women. So, its 3 years after the last movie and stuff is still happening. The Autobots hear about a special ship from Cybertron which landed on the moon. It contained their leader, Sentinel Prime (voiced by Mr. Spock), who has a load of knowledge that’ll probably help humanity or something. He comes to Earth and everything is going just swell. But, as we’ve learnt over the past 400 words, nothing is ever swell in the Transformers universe and Sentinel decides to team up with those pesky Decepticons! He also decides he wants to turn Earth into Cybertron, starting with Chicago. Well, the Autobots aren’t having any of that. They decide to have a big fight with the Decepticons. There are lots of explosions and loud noises, and then Optimus kills Sentinel. Everyone lives happily ever after – especially Sam, who doesn’t have to bother with any of this robot nonsense anymore because Mark Walhberg is replacing him in the next movie. Hooray! Enjoy Age of Extinction (and feel free to sell us those Transformers DVDs you won’t be needing anymore thanks to this guide…)!